Blinkle Provides worry-free 12-months warranty and free life-time technical support and professional after-sales for the mini humidifier usb. Please kindly contact us if there's any problem with the product, sure we'll solve it and provide excellent service for you! we do not suggest you use distilled water，because some of customer said they found the water drop on the device ，the detail reason as below：There's no any mineral or impurities in distilled water or pure water，the mist will combine with impurities such as dust in the air to from water droplets .so that's why some customers found the head of device get wet. ❥【2 Mist Modes 】:Mini humidifier Ultrasonic continuous spay and Interval spray mode,first modes:Touch the button, open continuous spray mode, which can continued work 4.5 hours and then AUTO Shutdown.Second modes:Touch the button again, become interval spray mode (spray 3 seconds and then stop 3 seconds become a cycle for different demand. ), which can work abourt 8 hours.Touch the switch again, turn off the spray. 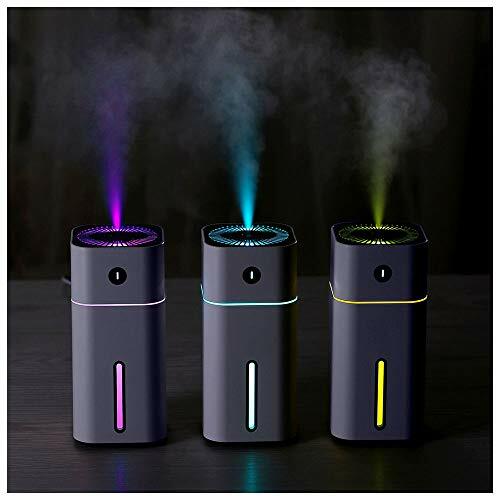 ❥【Quiet & 7 Soothing LED Light】:Small humidifier Quiet with low noise make it perfect for sleeping or reading time, Work quietly without producing any bothering noises.For the first time ,press and hold the button for 2 seconds,turn on 7-color auto changing mode.Press and hold for 2 seconds again, the light is lock.Press again for 2 seconds, turn off the light. ❥【Accept Mineral Water and Tap Water】This USB ultrasonic humidifier Just only suitable for mineral water and tap water. DON'T ACCEPT ESSENTIAL OIL, PERFUME, DISTILLED WATER, PURE WATER and Other liquid medicine.Make the water mist more delicate. ❥【Powered by USB charger】：The desk humidifier can work just only in the case of power supply with USB cable enbables you plug it in computers, cars or any plugs that is available for USB connection. fit your room or office perfectly. ❥【Get Blinkle CUP HUMIDIFIER RISK FREE】:Blinkle office humidifier,our worry-free 12-months warranty and free life-time technical support will make your purchase absolutely risk-free. Pls don't hesitate to mail us if you get any problems about the item, we will reply within 12 hours. If you have any questions about this product by Blinkle, contact us by completing and submitting the form below. If you are looking for a specif part number, please include it with your message.